I finally got some photos up on Flickr from our week in Death Valley. The Internet connections available at Furnace Creek are very welcome but not particularly robust, and uploading to Flickr was one of those things that I just couldn’t do. Now that we are out of the park and spending a night in nearby Pahrump NV, we’re back in the cell phone and Internet zone. Bert and Janie also came to Pahrump, to spend the day watching the presidential inauguration on TV. They’re parked right next to us. Bert has posted a blog about our travels in Death Valley over the past five days, so you can check his blog for a different perspective (or if you wonder if I’m really just making all this up). We’ve been to Death Valley twice before, and I am struck by how different each visit has been. The first time was about 15 years ago, when Eleanor and flew to Las Vegas, rented a car, and pitched a tent. We came out of the desert a few days later, covered in dust and filled with incredible experiences. 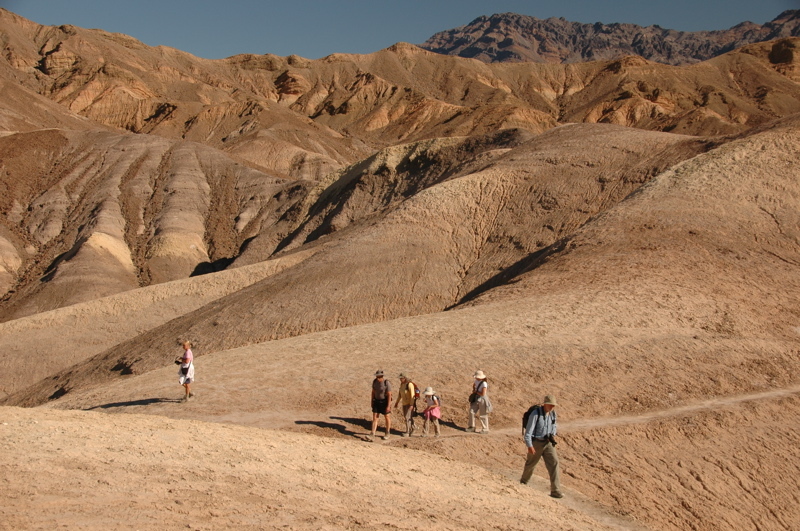 The second time was with Emma, in June 2006, and we felt the tormenting heat that Death Valley is famed for. This third trip has brought us to a new appreciation of the park. Bert and Janie showed us spots we didn’t know existed, and even the places we have seen before are different in the balmy January weather. Without a doubt, the through-hike from Zabriskie Point to Golden Canyon must rate as one of the most beautiful we’ve ever done, with the sun lighting up the canyons nearby and the snow-covered Panamint Range in the distance. The banded marble of Mosaic Canyon, the opulent swimming pool of the spring-fed Furnace Creek Inn, the slippery pumice slopes of Ubehebe Crater, the salty “chemical desert” of Badwater Basin … all of these are faces of Death Valley that we explored and enjoyed. It is a great place, and five days is just not enough. I am reminded of the fabled way Death Valley got its name. Emigrants crossing it suffered terrible losses, and when they finally emerged, one looked back and said in relief, “Farewell, Death Valley.” The name stuck. Now we are saying farewell, but with a different sense. We’re looking forward to returning. It’s time to clean up the desert dust in the trailer, get some supplies, and then head to Las Vegas. We’ve got work to do. For the first time, we’ll be staying on the famed Strip, at the Circus Circus KOA. It should be another very interesting week. We’ve stayed at the Circus Circus rv park (Pre KOA). If you’re lucky you can get one of he couple of sites with a tree, think shade, and a small patch of grass. Otherwise it’s all tarmac.